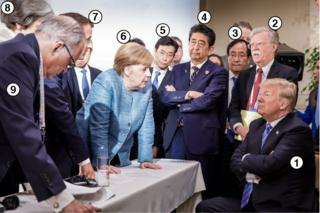 Trump at G7: Who's who in Merkel's photo? Awkward moments were expected at the G7 summit and an Instagram post from the official account of German Chancellor Angela Merkel appears to have captured one of them. Here's a who's who of the people pictured, and where they stand on the trade row that defined the summit. Mr Trump shocked America's allies - namely the EU, Mexico and Canada - when he recently announced a 25% tariff on imports of steel and 10% on aluminium from these countries. They are all threatening retaliatory measures and the rift overshadowed the summit, leaving the American president isolated at times. Mr Trump departed before the other leaders, and complained that America was "like the piggy bank that everybody is robbing". He then tore into Canadian prime minister Justin Trudeau in a pair of tweets, calling him "very dishonest and weak" and attacking his "false statements" after Mr Trudeau reasserted his strong opposition to the US tariffs in a news conference. It's been just three months since he was appointed President Trump's top security adviser but John Bolton has already made an impact. One of the president's arguments for the tariffs is on "national security grounds" - a view Mr Bolton has stridently backed. Promoted to the post in July 2017, he recently led a Japanese delegation to Pakistan and took part in joint talks between Japan, China and South Korea in Seoul about a proposed free trade agreement. He has come under increased pressure to join retaliatory measures against America's tariffs. This puts him in a difficult position - he has tried hard to cultivate a warm relationship with President Trump and the two are said to have met at least 10 times since he was elected to the White House. The MP from Japan's governing party once worked in the ministry of international trade and industry. She has been at the forefront of talks to try to resolve differences at the summit, as is clear in this photo. Mrs Merkel apparently floated an idea to set up a mechanism to resolve trade disputes between the US and its allies on Friday. Asked during the summit about her relationship with President Trump, Mrs Merkel said the two leaders did not always agree but could talk to each other: "I can say that I maintain a very open and direct relationship with the American president." He engaged in a Twitter spat with President Trump over the tariffs hours before the summit - leading some to question whether the blossoming "bromance" between the two was over. Despite this, they were seen to be on good terms, and President Macron's team said his talks with Trump were "frank and robust". However, following Mr Trump's online outburst against Mr Trudeau, the French president issued a statement that "international co-operation cannot be dictated by fits of anger and throwaway remarks". In a telephone call last week, she told President Trump she found the US tariffs "unjustified and deeply disappointing". But she also struck a more conciliatory tone at the summit, urging fellow leaders to step back from the brink of a possible trade war. Mr Trump's top economic adviser has defended the new tariffs and said his boss should not be blamed for trade tensions. After the summit, Mr Kudlow told CNN that the president and his team had gone to the summit "in good faith" but that Mr Trudeau had "stabbed us in the back" in his news conference. French President Macron tweeted an image taken at about the same time as the photo, but from a different angle, showing just how densely packed the G7 leaders and their assistants were as they gathered around President Trump. And another photo taken by Mr Trudeau's official photographer Adam Scotti shows a slightly happier scene, with Mrs Merkel smiling with Mr Trump and Mr Trudeau seeming to laugh. Mrs Merkel's photo has taken off on social media, spawning all sorts of memes and funny caption contests. The posture and confident body language of the powerful German leader were highlighted by many on Twitter, who said it was reminiscent of a schoolteacher telling off a naughty student (President Trump).